Primula PCI-5228 Green Mist Cast Iron Teapot 28 oz. This 2 qt. 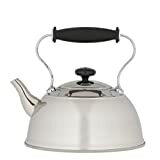 teakettle features a comfortable, easy-to-grip handle. The handle is made of stainless steel accented with soft silicone rubber. The kettle whistles when water comes to a boil and has a removable lid for easy cleaning and filling. The zen teapot is the adept fusion of strength and beauty. Elegant hand blown glass design accented by a classic bamboo handle rests on an elevated bamboo base. 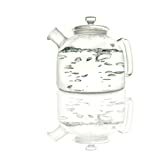 Featuring a borosilicate glass body and a removable stainless steel micromesh handle, bamboo stand and tea scoop. Borosilicate glass resists shock and breakage. 42-ounce/1.2 liter capacity. NewLeaf Tall Tea Mug is designed for simple and clean way of brewing just one fresh cup of tea. It also enable you to enjoy the color of your prized tea! Glass mug holds up to 16-Ounce. 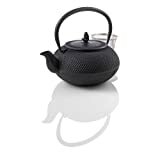 Our traditional Japanese hobnail pattern cast iron tea pot symbolizes strength. It is enameled on the inside for years of use, and to prevent rust and oxidization. 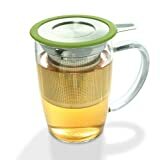 Includes a stainless steel mesh infuser for use with loose-leaf tea.